Mauro Bigonzetti’s Progetto Händel is intimate, expressive and beautiful to watch. Yes, for La Scala at least, it is low-cost – an EasyJet ballet – and you could see something similar with another company for a quarter of the price, but if you don’t have to worry about your wallet this is certainly a programme to see. Progetto Händel finds Bigonzetti in Bigonzetti Country. I was praying that I would like this work as otherwise it would seem that I were harbouring a vendetta against him after my recent articles. My prayers were answered. While the work is not ideal for La Scala – only a small group of dancers, no scenery, and no orchestra – it works perfectly as a contemporary ballet piece, is just right for touring, and ideal for most theatres who are not blessed with a large corps de ballet, a world-class orchestra, and avant-garde stage machinery. Bigonzetti certainly loves this music, in fact it is not the first time he has used Handel’s music as his score, and his movements caress, reflect and illuminate these impeccably crafted compositions. Progetto Händel is in two parts. The first sees the dancers in monochrome costumes in a black space under Carlo Cerri’s precise, clean lighting. James Vaughan is at the piano playing Handel Keyboard Suites, with two main dancers and fourteen others. The second part introduces a little colour, and a violin, oboe, flute and cello join Vaughan who plays a harpsichord. The same main couple are accompanied by twelve other dancers (some are the same, some are different… I don’t know why). There is no narrative, though there’s tension, much sensitivity, and some witty touches. After an ensemble opening of beautifully lit contorting bodies, Progetto Händel proceeds with a series of solos and duets, starting with a gorgeous, sinuous Maria Celeste Losa. Helena de Medeiros’ skilfully constructed costumes are half costume and half sculpture, like deconstructed tutus. The girls strut and preen; exotic birds with curious plumage. Oddly, a few have their ‘feathers’ in front, leaving small, shiny buttocks on display, like perky baboons. Stefania Ballone stands out, as always, with her strong personality and equally strong moves. Timofej Andrijashenko and Antonella Albano’s long duet was fascinating in its gymnastic invention, yet tender and intense. Tender too were Marco Agostino and Christian Fagetti who wrapped themselves around each other with a forceful softness, and Gioacchino Starace is constantly first-rate. The main couple do not dominate in the first part, but come into their own after the interval. The curtain parts to reveal a knot of undulating limbs, dimly lit, which are revealed to be those of Svetlana Zakharova and Roberto Bolle. There is a reason a star dancer becomes so, and Zakharova, especially, shines brightly above the rest. She was a goddess, and Bigonzetti has mined her many strengths and put them on display. It is always interesting, and occasionally amusing, to watch a classical ballet company trying more contemporary moves. Some dancers are unable, or psychologically unwilling, to step outside the ‘rigidness’ of their classical training. Not so with Zakharova, she goes from an arabesque to unaligned flexibility with ease and naturalness. It is the quality of her movement that makes her standout with her never-ending port de bras and the varied dynamics she applies to each step. That twelve o’clock leg is never repetitive because she uses it like a soprano uses a top note: sometimes it’s sung forte, other times piano, occasionally it is arrived at via a portamento, and it can die away with a diminuendo. It keeps the audience on the edge of their seats. Magical. Bolle, too, has been treated well by Bigonzetti who has given him all his favourite moves, and even a nod to his Basilio with a slow, high relevé on one foot. His fans were out in force, and when two small cuddly toys were thrown from the gallery during the curtain call, he looked a little sheepish as he handed a white bunny to Zakharova. More used to baskets of roses at the Bolshoi, she played with its ears bemusedly as they walked upstage to join the other dancers and they both, wisely, left the fluffy creatures there. Their main duet is set to the Sarabande from the Suite in D minor – known in my house as ‘the Barry Lyndon music’ – and in La Scala’s vast auditorium you could have heard a pin drop. In this second part, costumes similar to those already seen are now subtly coloured and the atmosphere is more expansive. Notable here was Fagetti dancing alongside Walter Madua, and Massimo Garon who gave his solo flair. 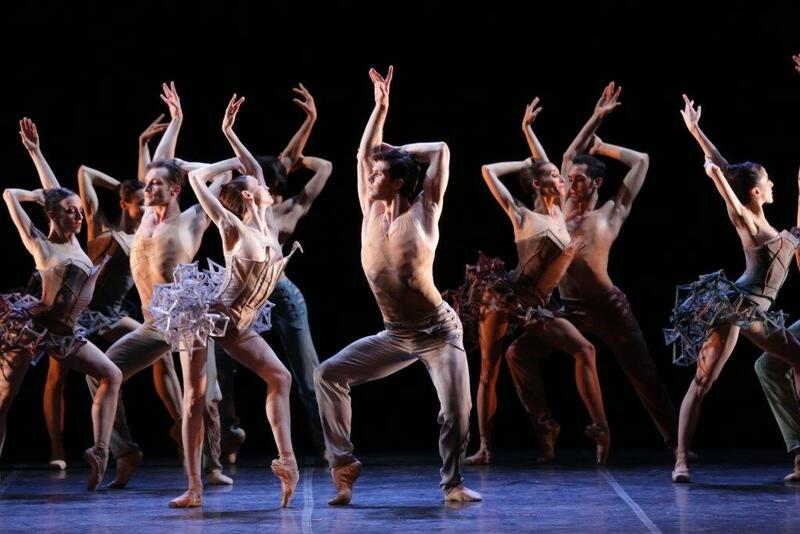 The piece ends as the lights fade on all the pairs echoing the opening movements. The applause was long and well deserved.